Kodaikanal is one of the most popular hill resorts in India. Kodaikanal (also known as Kodai) is a city and a Taluk division of Dindigul district in the Indian state of Tamil Nadu, India. It is a charming hill station, stands amidst sylvan beauty on the southern crest of the upper Palani Hills near Madurai in Tamil Nadu. With its rocks, woods, lovely lake and bracing air, Kodaikanal is an ideal hill resort for the tourists. The unique flowering plant Kurunji Strobilanthus Kunthanus that last bloomed in 2004, is nature's gift to Kodaikanal. Kodaikanal located amidst the folds of the verdant Pali hills is one of the most popular serene hill stations in India, which mesmerises any visitor and is frequented all through the year. Kodai is situated at an altitude of about 2,133-m high and covers an area of 21.45-sq-km. The hill town is renowned for its educational institutions of international repute. The hill-plantain fruits and plums are known for their freshness and taste. Berijam lake, one among the beautiful lakes of South India, spreads over an area of 24 hectares. Geography: Kodaikanal stands in a 2195 m (7202 ft) high basin at the southern edge of the central part of the Palani Hills in the Western Ghats. It is located between latitude 10°7' N-10°20' N & longitude 77°16' E-77°45' E. It has a beautiful lake and numerous scenic mountain views of the plains below. Climate: The climate of Kodaikanal is pleasant throughout the year. Kodaikanal experiences rain between the months of June and September. The average rainfall is about 1650 mm, annually. Temperature varies from moderate to quite cool - during March to May. In January, night temperatures sometimes drop to freezing, and thin ice is seen on the lake edges. Kodaikanal (also known as Kodai) is a city and a Taluk division of Dindigul district in the Indian state of Tamil Nadu, India. Kodaikanal is one of the beautiful hill stations that mesmerises us with her beauty. Kodaikanal is a very quite and charming hill resort. Also known as Kodai, it is a favorite hill destination for holidayers and honeymooners. It is the only hill resort developed by americans in India. The two places visited by the tourists here are the Suicide point and pillar rock. 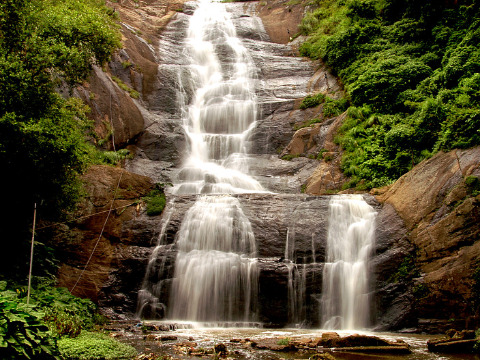 Other places of tourist attraction are the Silvers falls, Kodai television tower, guna cave. It is a romantic hill station for the newlyweds to go for a honeymoon. An artificial star shaped 45 ha. (60 acres) lake built in 1863 is located close to the centre of town. Next to the lake is Bryant Park, a botanic garden. Rowing boats and pedalos and riding horses can be hired. Elephant Valley: (Palni Hills) Elephant Valley is a 100 acre nature reserve and organic farm welcoming Eco-tourists located in the Palni hills, Tamil Nadu an area of the Western Ghats in South India which is one of the 25 Biodiversity hotspots of the planet. Kodaikanal, the well-known hill-station is just 20 km away. Kodai is situated at an altitude of about 2133 m high and covers an area of 21.45 sq km. Click on link For a list of distances from Kodaikanal to various cities . Kodaikanal is connected by road with Chennai (520 km), Ooty (236 km), Trichy (197 km), Coimbatore (138 km), Kumili (160 km), and Madurai(120 km). Regular bus services are available from Madurai, Palani, Kodaikanal Road, Theni, Dindigul, Tiruchirapalli, Kumuli (Thekkady) and Coimbatore. Kodai Railway Station (80 km) and Palani Railway Station (64 km). Airport at Madurai (120 km) and Coimbatore (135 km). The nearest airport at Madurai (120 km) gets daily flights from Chennai, Bangalore, Trichy and Mumbai. From there on it is possible to reach Kodai by train and road. All the festivals celebrated in Tamil Nadu are popular in Kodaikanal. Summer festivals are celebrated at hill stations of Tamil Nadu including Ooty, Kodaikanal and Yercaud. These summer festival involve many Cultural programs, adventure sports, boat races, flower and fruit shows, etc,. add charm to the festival. Kodaikanal is a place, which is known for its wondrous and ancient churches. The rich Christian culture and traditions of Kodaikanal still stand apart. One of the primordial churches is the Mother Salette church, which is 133 years old. Every year on the 14th and 15th of august, a unique carnival takes place at this church. Kurinji Andavar Temple: Some 3 km northeast of the Kodai Lake is the Kurunji Andavar Temple, dedicated to Murugan, Lord Shiva's son. It is named after the amazing Kurunji flowers associated with the God. This temple was built in 1936 by an European Lady, who on coming to India, got faith on Hindu religion and started following it. She changed her name as Leelavathi married Mr.Ramanathan. She is also known as Lady Ramanathan. The temple not only quenches the religious thirst of the tourist, but also provides heavenly view of the Palani hills. Telescope House: Located at Coaker's Walk, Kodaikanal, the Telescope House facilitates visitors to have a panoramic view of the valley and nearby towns. Solar Physical Observatory: It was found in 1989 at the top most point in Kodai at an altitude of 2343 m. Visitors are allowed to closely observe the stars, planetary movements during visiting hours and on prior appointments. Perumal Peak: The place, 11 km from Kodaikanal, is considered a trekker's delight in Nilgiris. No permission is required for trekking to Perumal Peak. Climbers begin their ascent from the Neutral Saddle and cover the entire distance in around 4 hours. Adventure And Trekking in the Nilgiris: The Nilgiri is a trekker's paradise. There are treks and treks in whichever direction you turn and from whichever point you start. A trek can be full of thrill, excitement and adventure and a way of seeing and enjoying nature in all its beauty and splendour. There really isn't anything by way of nightlife but you could catch a movie at the local cinemas. 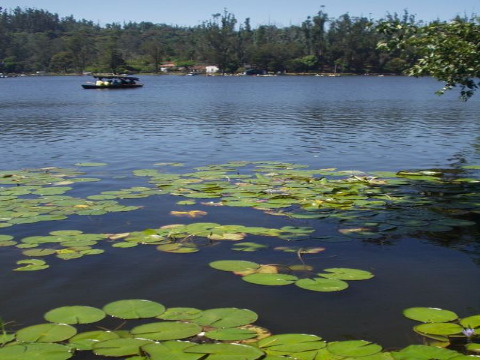 Berijam Lake: Berijam Lake is situated at a distance of 21 km from Kodaikanal. It is an ideal picnic spot and camp site and is very famous for its pristine waters. You can trek to explore the utmost beauty of the place. One can definitely look forward to buy artifacts and gift items in this place. The famous places to shop in Kodaikanal are the Khadi Emporium, Handloom Co-operative Stores and Travancore Crafts Work, Government Sales Emporium, Kurinji Mini Supermarket, Spencer and Company. Shebaganur Museum: Nearly 5.6 km from Kodaikanal, Shebaganur Museum offers more than 300 exotic orchid species and artifacts of the ancient Paliyans tribes people whose descendants still live in these hills. It is also regarded as one of the best Orchidoriums in the country. Coonor: It is an enchanting hill station located in the Nilgiri hills about 19 km from Ooty. It is the second largest hill station in the Niligri hills. Bryant Park: This botanical garden is situated on the eastern side of the Berijam Lake and is known for flowers, hybrids and rafts. Here, the annual horticultural show is conducted every summer in the month of May. Star Shaped Lake or Kodaikanal Lake: This outstanding man-made lake was created by Sir Vere Henry Levinge, a former District Collector of Madurai. Kodaikanal Lake is one of the main attractions of Kodaikanal. The lake offers leisure activities like boating and fishing. It is in the form of a star and is spread over an area of twenty four hectares. It is the favorite hang out of the visitors because of its serene surroundings. Berijam Lake: Discovered by Spanish and British people, Berijam Lake is situated at a distance of 21 km from Kodaikanal. It is an ideal picnic spot and camp site and is very famous for its pristine waters. You can trek to explore the utmost beauty of the place. Fruits like plums and plantains grow abundantly on the wooded slopes apart from a wide variety of flowers. The summer festival that is held at all Tamil Nadu hill stations in May features flower shows, dog shows, boat races and the like. This is the high season, so Kodai becomes a little more crowded than usual. Some light warm clothing even in the summer months would stand you in good stead because the nights get quite cool. An umbrella or a raincoat is a good thing to carry in case it rains. Most of Kodaikanal can be covered on foot. Mountain bikes and ordinary bicycles can be hired from rental shops. A visit to The Summer Festival that is held at all Tamilnadu Hill Stations in May features flower shows, dog shows, boat races and the like.